The Dragonfly cabin is now pet-friendly. Take US-4 to exit 4 VT-30 N, Take VT-30 N 7 miles, turn Left on Hortonia Rd., in 1.7 miles turn left on Black Pond Rd., Park is on left in 2.1 miles. Take US-7 South to VT-30 in Middlebury. Follow VT-30 S for 21.8 miles, turn right onto Hortonia Rd. In 1.7 miles turn left onto Black Pond Rd. Park is on left at 2.1 miles. Camping: There are 52 tent/RV sites and 11 lean-to's for campers. There are also 5 cabins and 1 cottage available to rent. Hiking: The park has a vast trail system, offering hikes for all ages and abilities. Swimming: There are two small, sandy beaches great for sunbathing and swimming. Boating: Boats are welcome at the park. Kayaks, canoes, pedal boats and row boats can be rented from the park office. Nestled away in the forests of 3,500-acre Bomoseen State Park sits the quiet camping area of Half Moon Pond State Park. The park is located in the dense woods of a small, sheltered basin, surrounding Half Moon Pond. 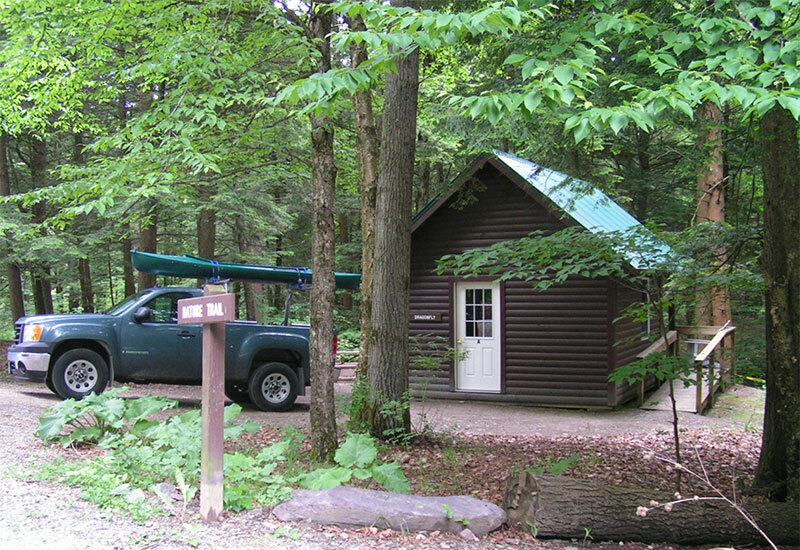 The campground offers camping for all tastes with its waterfront campsites and lean-to's and five furnished cabins. For those seeking more creature comforts, Tall Timbers Cottage, with its waterfront location and private boat dock, offers all the amenities of home. A perfect place for campers seeking a respite from the hustle and bustle of daily life, the park offers a vast trail system including a short walk or, for the more ambitious, a full-day’s hike. Hikers are likely to see a variety of wildlife including white-tailed deer or an occasional moose. With sites both on the water's edge and in the woods, the 52 tent/RV sites, 5 cabins and 11 lean-to sites provide great camping opportunities in a quiet, peaceful environment. There are restrooms with flush toilets, hot and cold running water and coin-operated showers. There is also an RV dump station. There is a play area and hiking trails to High Pond and to Bomoseen State Park. Motorized watercraft are not allowed on Half Moon Pond. Rowboats, kayaks, canoes and pedal boats are available for rent from the park office, and two small, sandy beaches provide locations for sunbathing and swimming. The pond also has excellent fishing, where anglers can catch panfish, yellow perch and largemouth bass. Other exceptional fishing opportunities can be found at nearby Glen Lake and Lake Bomoseen. 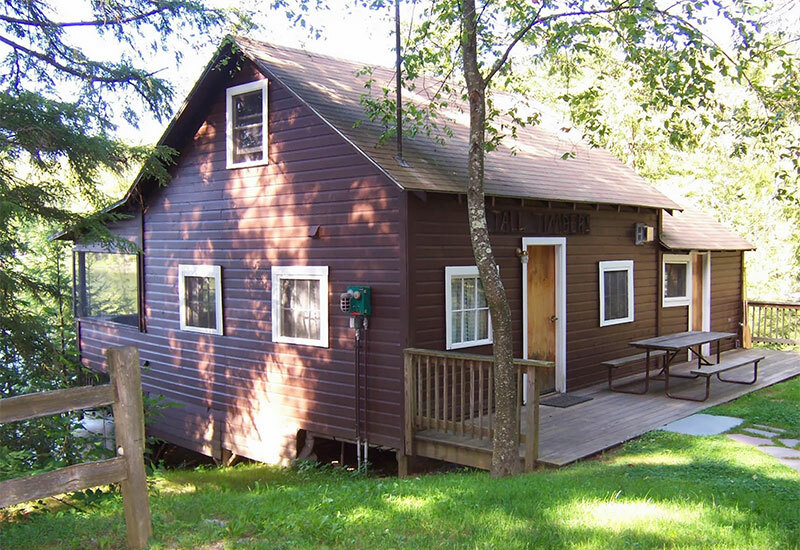 In addition to the five cabins available to rent, Half Moon Pond also rents the Tall Timbers Cottage. Located on the waterfront, the cottage sleeps 6 people and comes with a private dock.